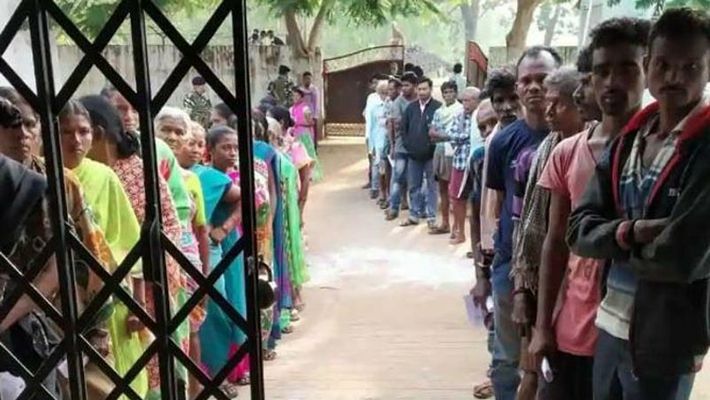 Raipur: Polling has started for the second and final phase of the Chhattisgarh Assembly elections amid tight security. As many as 19,296 polling booths have been set up for the second phase. Extra security is being maintained in Naxal-affected Gariaband, Dhamtari, Mahasamund, Kabirdham, Jashpur and Balrampur districts. Polling was halted in Balrampur's Mahaveerganj, Deviganj, and Bhanaura polling booths after the EVM machines installed stopped working. The Congress has said that faulty EVMs are being deployed in the party's stronghold areas. Congress leader PL Punia is having a meeting with the Election Commission in Delhi to discuss the tampering claims. As many as 1,079 candidates, including 72 each from the BJP and the Congress, are in fray. Of the 72 seats, 46 are for the general category, while nine are reserved for Scheduled Castes and 17 for Scheduled Tribes candidates. In 2013, the BJP had won 43 seats in the 2013 polls while the Congress had bagged 27. One seat each was won by the BSP and an independent candidate. Gariaband, Dhamtari, Mahasamund, Kabirdham, Jashpur, and Balrampur are the Naxal-affected districts going to polls in the second phase. In the first phase, Naxals attacked the security forces and party candidates in the Bastar region. On November 12, during the first phase of polling, an encounter had broken out in Pamed area of Bijapur district and an IED bomb went off barely a kilometer and a half away from the polling booth in Tumakpal, near Katekalyan area in Dantewada. IED bombs were also found near polling booths and diffused successfully in Konta and Bijapur. The fate of nine ministers, the Assembly speaker will be decided in the polls. While the Chhattisgarh Assembly speaker Gaurishankar Agrawal is fighting from Kasdol. Opposition leader and Congress' TS Singh Deo is contesting from Ambikapur for the third time. Former chief minister Ajit Jogi, having left the Congress, is fighting from Mariachi. His wife Renu Jogi is contesting from Kota, whereas their daughter-in-law Richa Jogi is contesting from Akaltara on a BSP ticket. Bilaspur division has 24 Assembly seats, the highest among the five divisions in the poll-bound state and is expected to play a crucial role in deciding the winner. Located in the centre of the state, the division comprises of five districts — Bilaspur, Mungeli, Korba, Janjgir-Champa and Raigarh. In the last polls, BJP won 12 seats, Congress 11 and BSP taking away one. However, this time the fight is crucial as after Mayawati and former chief minister Ajit Jogi's Janata Congress Chhattisgarh (J) joined hands. While the BSP is contesting 10 of the 24 seats in the division, the JCC(J) has fielded candidates on the rest.